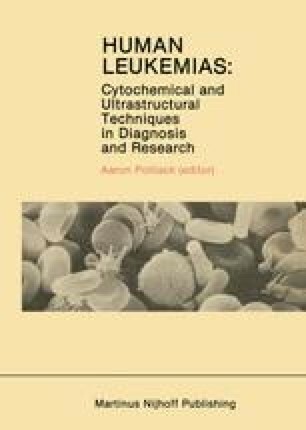 The recognition of subgroups of leukemias by morphologic and cytochemical criteria has greatly contributed over the past decades in the differential diagnosis, classification, and prognosis of the leukemic proliferations [1–13]. In 1964 Hayhoe and his associates  in a combined morphologic and cytochemical study of acute leukemias were able to determine four different types of leukemias: acute myeloblastic, acute myelomonocytic, acute lymphoblastic and erythremic myelosis. A few years later Schmalzl and Braunsteiner  and Daniel et al. separated the acute monocytic leukemias from the other acute leukemias using the sodium fluoride sensitive naphthol AS-D acetate esterase reaction (NASDA + NaF).